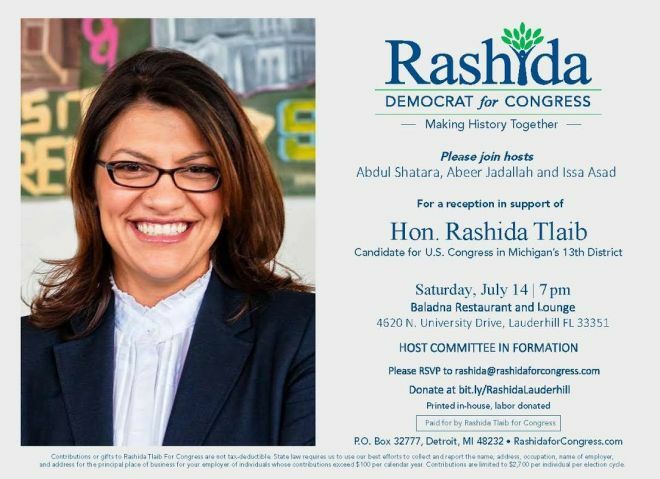 When she ran for Congress last year, Michigan Democrat Rashida Tlaib received financial support from Muslims and liberals nationwide. Now she is being defended by those same elements as she uses vulgar language to call for the impeachment of President Trump and advocates for the destruction of the state of Israel. Down in little Hallandale Beach, Florida, a local city commissioner is in big trouble because she had the audacity to voice her opinion about the outspoken new Muslim Congresswoman from Michigan, Rashida Tlaib. Tlaib also is known to be rabidly anti-Semitic. A map of the Middle East in her office has a sticky note pasted over the state of Israel that says “Palestine” and she is friends with pro-Sharia activist and Women’s March co-founder Linda Sarsour. Both Sarsour, who has called for U.S. Muslims to wage political “jihad” against the Trump administration, and Tlaib are Palestinian-Americans who actually are more Palestinian than American in their worldview. But Tlaib’s district in Michigan includes the heavily Islamized Dearborn and Detroit, so that’s how she ended up being elected to Congress. While Speaker Nancy Pelosi and the Democrats have granted Tlaib wide space to speak her mind, the Muslim congresswoman’s critics must hold their tongues or lose their jobs. Two of Lima-Taub’s fellow commissioners immediately came to Tlaib’s defense and condemned their colleague, saying her Facebook comment “embarrassed” the city of Hallandale Beach. The Council on American-Islamic Relations, or CAIR, took it a step further and demanded Lima-Taub not only apologize to Muslims but resign from office. You can watch the CAIR mouthpiece below accusing Lima-Taub of committing the unpardonable sin, which is part and parcel of Islamic Sharia law – that of criticizing Islam or its followers. Rather than point out Tlaib’s own radical anti-Semitic leanings – she and Omar are the only two members of Congress who openly support the BDS movement against Israel and also want to cut off all U.S. aid to the Jewish state – the media focuses its wrath on those who criticize her. In doing so, the media is acting in alliance with CAIR, which has been named as an unindicted co-conspirator in the 2007 case of U.S. v. Holy Land Foundation for Relief and Development, which led to the largest terror-financing trial in U.S. history. But leftists are shameless. While they are easily “embarrassed” by anyone who points out Islam’s violent nature, no amount of anti-Christian or anti-Jewish sentiment expressed by their Muslim friends will cause them embarrassment. The above facts are provided by Open Doors, a leading authority on the global persecution of Christians, who are the targets of 80 percent of all acts of religious discrimination in the world, almost all of it committed by communists and Islamists. For these and other atrocities, the Muslim apologists couldn’t care less. No red faces of embarrassment. So here we have a terrorist-tied organization in CAIR telling Americans what we can and cannot say about Islam under penalty of losing our career, which is our way of making a living and putting food on our tables. Now, you can take this dust up in South Florida as a one-off or you can dig deeper and take it as a teaching moment about the way Islam uses lightning rods like Rashida Tlaib to promote Sharia principles and embed them into the consciousness of non-Muslim Western societies. While it may be easy to dismiss Tlaib as simply a crazy woman with a big mouth, she is actually very useful to her friends at the Muslim Brotherhood-connected CAIR, ISNA, MSA and myriad other Brotherhood front groups so entrenched in the United States. Rashida pops off with a comment at a news conference meant to inflame and incite those of us who see through her pro-Sharia agenda. Anticipating the pushback from patriotic Americans, the folks at CAIR then dial up their friends in the left-leaning mainstream media and get them to push back against the pushback, calling for apologies and resignations of the offending infidel, in this case Annabelle Lima-Taub. Local, regional and national media all picked up and ran with the story, from the local Sentinel newspaper, to CNN and Salon magazine. This is called the “piling on” effect, with all of the articles using blatantly slanted language to tilt the story toward CAIR’s agenda. Notice Rozsa’s use of the word “Islamophobic.” This word is an invention of the Muslim community to turn attention away from persecuted Christian minorities, who are being brutally beaten, tortured, kidnapped and killed across the Middle East in places like Egypt, Syria, Iraq and Iran and in African nations such as Nigeria, Sudan and Kenya. Let’s be clear: Christians are being killed en masse, but Muslims are worried about “Islamophobia” in Western nations where only the most radical Muslims might get called a mean name or be accused of being a potential terrorist. This way, the much bigger problem of “Christophobia” gets swept under the rug. Lest anyone think the harsh treatment of Annabelle Lima-Taub applies only to public officials and politicians, think again. Numerous people in the corporate world have lost jobs over this issue, and I can speak from personal experience that any journalist who touches this subject will be blackballed from the mainstream media. It’s the same in public education. No teacher can teach the facts about Islam’s history of violent jihad and keep his or her job in our nation’s public school systems. They will be accused of “Islamophobia” by CAIR and removed. Clearly, the West is being brought into compliance with a key element of Sharia. It’s a phenomenon that has happened gradually over the past 10 or 12 years, right under our noses. Western liberals have been falling all over themselves to voluntarily submit to the first rule of Sharia – thou shalt not criticize Islam or Sharia-adherent Muslims and if you do, you are “not fit” for whatever job you may hold. Any forward-thinking conservative should be asking how long it will be before our Western societies submit to other sacrosanct rules of Sharia. Will women be encouraged to cover themselves in public? Will Muslim men be allowed to beat their wives and perhaps have more than one wife? Will homosexuals be thrown off buildings or punished in some other gruesome fashion? These are all Islamic ideas, perfectly acceptable in Islamic Sharia-compliant societies. If we can accept one rule of Sharia, why not provide a space for the entire smorgasbord of anti-Western cultural values? We’ve already seen the liberals turn a blind eye to the growing menace of female genital mutilation in our culture, a very real threat that the Centers for Disease Control says is faced by more than 500,000 young women and girls in America, most of them from migrant families that hail from Africa and the Middle East. This is why we must push back and push back hard whenever CAIR and its allies on the American left try to condemn one of our upstanding citizens for speaking out against Islam. We don’t hate Muslims. We hate the religious/political ideology that enslaves them, especially their women, in more than 57 nations across the Muslim world and increasingly here in America, Canada and Europe. The so-called “free world” is becoming less free by the day, thanks to the Muslim Brotherhood strategy of civilization jihad being played out to perfection, right under our noses. While we cannot control what Muslims do in their own lands, we most certainly have a right to demand they respect our freedoms here at home. 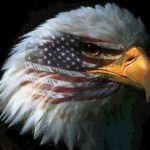 First among those freedoms in the freedom of speech, rooted in the First Amendment to our Constitution. Any media outlet that quotes a spokesperson for the anti-American CAIR should be outed as a propaganda outlet for political Islam. We should cancel our subscriptions to these fake-news publications and condemn them at every opportunity as enemies of the American people and the free world. They don’t work for us. They work for CAIR. 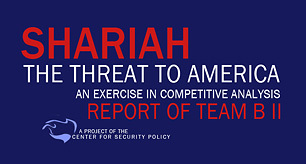 If they are too lazy, too scared or too stupid to research and reveal the true roots of CAIR and other Muslim Brotherhood-influenced organizations, then they do not deserve our support. They do deserve our strong denouncing. If Facebook and Twitter wish to become nothing more than echo chambers of the left by banning us from their social media platforms, then so be it. We will not be silenced. Leo Hohmann is an independent freelance journalist and author of the 2017 book “Stealth Invasion: Muslim Conquest through Immigration and Resettlement Jihad.” He is working on a follow-up book that will investigate the deceptions of the Interfaith movement and how it ties into end-times prophecies found in the Bible. If you would like to support his work, please consider a donation of any size. He accepts no advertising and is beholden to no corporate entity. Next articleWhy Does Pope Francis’s New Morocco Logo Imply Submission To Islam?